Majesta Coupon is a mailable coupon available from Save.ca. Visit Save.ca, select the coupon, create your own save.ca account and request to claim your coupon. You should receive the coupon in the mail within 1-2 weeks. The coupon is free and mailed out to you for free as well. 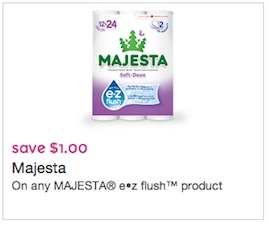 This is a Majesta coupon to save $1 on Majesta EZ flush bathroom tissue product. Majesta EZ flush coupon is valid only in Canada. You can find Majesta EZ flush bathroom tissue in any supermarket, grocery store, Walmart and more. 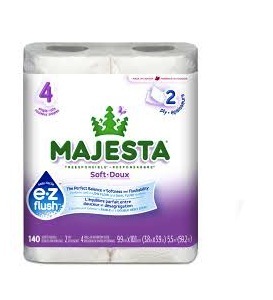 MAJESTA e•z flush: a quality bathroom tissue that breaks down quickly. Soft, 2ply MAJESTA e•z flush is shaking up the way people are shopping for bath tissue. Because e•z flush breaks down quickly in water, it’s the ideal bath tissue for homes with low flow and dual flush toilets, families with kids, cottages, RV’s and septic owners. Whether you prefer single, double or mega rolls, MAJESTA e•z flush has the value and a size and reliability that will fit your household. Look for MAJESTA e•z flush’s distinctive new pack in stores now.